EnviroGRIDS has developped its own capacity building strategy to stengthen people, institutions and infrastructures for GEO and INSPIRE activities in the Black Sea region. Several workshops are being organized around the Black Sea to Bring GEOSS and INSPIRE into practice, and to present them to important decision and policy makers makers. The Black Sea regional training workshop series "Bringing GEOSS Services into Practice", sponsored by the European Commission’s 7th Framework Programme (FP7) project enviroGRIDS, aims at teaching how to install, configure and deploy a set of open source software to publish and share spatial data and metadata through the Global Earth Observation System of Systems (GEOSS) using OGC web services & ISO standards. GEOSS has been created as an international voluntary effort that connects y geospatial and Earth Observation and information infrastructures, acting as a gateway between producers of environmental data and end users. The aim of GEOSS is to enhance the relevance of Earth observations and to offer public access to comprehensive, near‐ real time data, information and analyses of the environment. The training workshop covers interoperability, hands‐ on experience with web portals, information access, open source software and spatial data sharing through web services and the GEOSS registries. Consult the project agenda to see when the next workshops are planned in the Black Sea region. The Black Sea Catchment is internationally known as one of ecologically unsustainable development and inadequate resource management, which has led to severe environmental, social and economic problems. The enviroGRIDS project addresses these issues by taking advantage of emerging information technologies that are revolutionizing the way we are able to observe our planet. The Global Earth Observation System of Systems (GEOSS), being created by the Group on Earth Observations (GEO), provides a framework and the information for environmental management and decision making perspective. enviroGRIDS aims to enhance GEOSS by building the capacity of scientists to assemble such a capability in the Black Sea Catchment, the capacity of decision-makers to use it, and the capacity of the general public to understand the important environmental, social and economic issues at stake. This workshop provides a high level overview of GEOSS and data interoperability as they relate to the needs of senior government officials and decision makers in the Black Sea area. "Bringing GEOSS services into practice" aims at teaching participants how to install, configure and deploy a set of open source software to publish and share data and metadata through the Global Earth Observation System of Systems (GEOSS) using OGC web services & ISO standards. 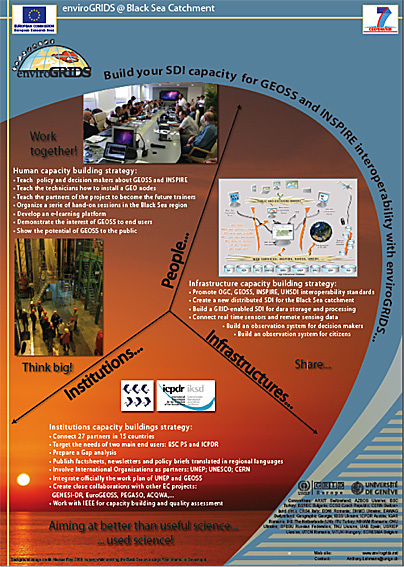 GEOSS has been created as an international voluntary effort that connects geospatial and Earth Observation and information infrastructures, acting as a gateway between producers of environmental data and end users. The aim of GEOSS is to enhance the relevance of Earth observations and to offer public access to comprehensive, near-real time data, information and analyses of the environment. This meeting is held within the framework of the enviroGRIDS project that addresses the environmental problems surrounding the Black Sea Catchment. This area is known as one of ecologically unsustainable development, where inadequate resource management has led to severe environmental, social and economic problems. enviroGRIDS aims at improving this by building capacities for sharing and exchanging environmental data through GEOSS. Below are found the CD-ROM ISO image distributed during the workshop, as well as all individual files contained in the CD. The Virtual Training Center of the enviroGRIDS research project is set-up for providing various learning resources to the project partners, stakeholders from the Black Sea Catchment involved in environmental management at different levels and anyone who is interested in the research topics covered by enviroGRIDS. Learning material in the virtual training center is provided from existing resources available within the enviroGRIDS consortium partners, resources generated through the research activities of the project and various contributions from workshops, symposia and conferences organized with collaboration or participation of enviroGRIDS partners in which contributions are provided from external partners, but on topics closely related to enviroGRIDS. Since enviroGRIDS is an ongoing project, learning resources are added continuously. The complete set of learning resources and their final structuring is expected at the end of the project. Soil data Batjes, N.H., 1995. A Homogenized Soil Data File for Global Environmental Research: a Subset of FAO. Working Paper and Preprint 95/10b. International Soil Reference and Information Center, Wageningen, the Netherlands. Fertilizer IFA/IFDC/IPI/PPI/FAO, 2002. Fertilizer Use by Crops, fifth ed. International Fertilizer Industry Association, Rome. DEM EROS Data Center, 1998. Global 3000 Digital Elevation Model (http://edcwww.cr.usgs.gov). Anonymous ftp access at edcftp.cr.usgs.gov. Slope USGS - United States Geological Survey, 2000. HYDRO1k. Climate data Mitchell and Jones, 2005: An improved method of constructing a database of monthly climate observations and associated high-resolution grids. Int. J. Climatology, 25, 693-712, Doi: 10.1002/joc.1181.